In this article we will show you, How to write a C Program to Reverse an Array using While Loop, For loop, Functions and Recursion with example. 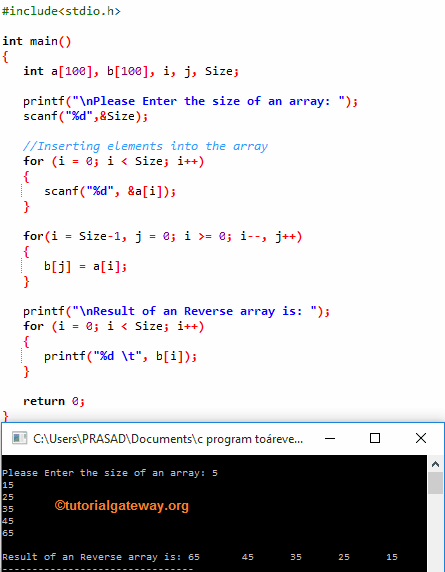 Below For loop in C reverse array program will help to iterate each and every cell present in the a array. For loop iteration will start at 0 and the condition inside the for loops (i < Size) will ensure the compiler, not to exceed the array limit. Next, The Condition inside the While loop will make sure that, the i value is less than j. Inside the while loop we performed the Swapping with the help of third variable. If you want to perform the swapping without any temporary variables then please refer Swapping without using Temp Variable article. Last, We used the for loop to print the reversed array to the console output. ANALYSIS: In this example, we just replaced the while loop of c reverse array with For Loop. Apart from that, everything is same. Next, we also declared one more function to print the Array. When the compiler reaches to printArray (a, Size) line in main() program, compiler will immediately jump to the following function and executed the code inside that function. W already explained the Code or logic in the above example. Within the above function of a reverse array in c program, If statement will check whether the Start position is less than End position. If the condition is TRUE then only statemnets inside this If block will be executed. Inside the If statement we written following statement to call the function Recursively with updated value. If you miss this statement in this c reverse array program then, after completing the first line it will terminate. We already explained the Code or logic for reverse an array in c in the above example.